Reduce the appearance of dark circles and discoloration with this Brightening Eye Cream that has a potent blend of peptides, DMAE, CoQ10 and black tea. Vitamin-rich to hydrate and moisturize for optimum age defy results. Visibly reduces the appearance of wrinkles and brightens the eye area with DMAE, CoQ10 & alpha lipoic acid. 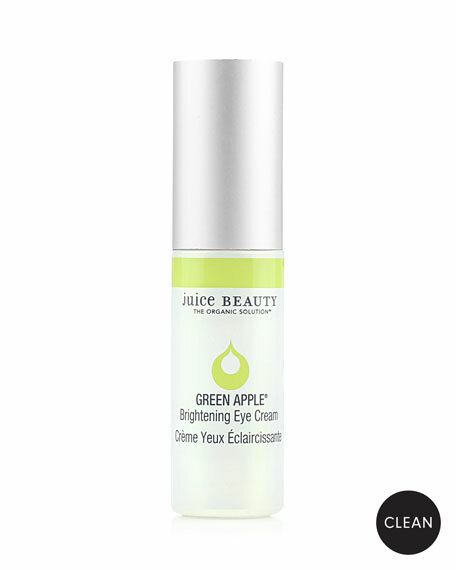 Packed with vitamin-rich nutrients of A, C, K, P & E.
The Juice Beauty GREEN APPLE® Brightening Eye Cream is designed for all skin types (except sensitive skin), 20's and up and is effective for dark spots, discoloration, uneven skin tone and texture. NOTE: the Juice Beauty GREEN APPLE® Brightening Collection is not designed for very sensitive or rosacea skin due to the alpha/beta hydroxy fruit acidsif you have this type of skin, see the Daily Essentials Collection. Starting with an organic botanical juice base, Juice Beauty skincare delivers highly effective results without the use of inexpensive fillers. These nutrient- and antioxidant-rich products help fight the signs of aging and defy blemishes.